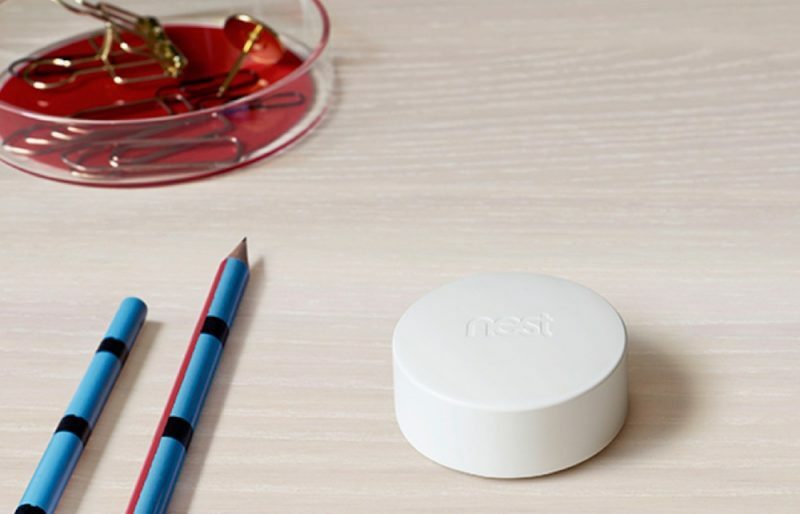 Nest's new Temperature Sensor, which works with the company's latest Learning Thermostat and the Thermostat E, is available to buy online from today. The battery-powered, inch-wide sensors are designed to be placed in different rooms around the house where they silently monitor how warm or cold it is. The white puck-shaped sensors continually relay this information to the companion thermostat, which responds by adjusting the central heating system to keep those rooms at the temperature level the user specified. Nest started taking pre-orders for the Temperature Sensor in March, but is now selling them direct from the website. Each sensor costs $39, or $99 for a three-pack, and comes with wall mounting screws and up to 2 years of battery life. Up to six sensors are supported per connected thermostat, and up to 18 are supported per home. Customers looking to pick up a Nest Learning Thermostat or Nest Thermostat E can also order the Temperature Sensor as part of a bundle pack, which gets them $20 or $10 off the standard price for a single sensor, respectively. Can’t resist @ “...silently monitor how warm or cold it is.” Is there a product out there that monitors these things loudly? Have had similar functionality through my ecobee for a couple years. Does a good job of regulating temperature. You can basically set up zones for where you want the temperature read from, what days or time of days to ignore, etc. Very helpful. Another cool feature: It's an occupancy sensor that you can tie into other automations. Unless this also has an occupancy sensor, it won’t do what Ecobee does. Ecobee allows you to use remote sensors in ways configurable around occupancy. For example, averaging in the temperature readings from a particular room only when that room is occupied, changing the mode from “away” to “home” if certain sensors detect occupancy, etc. The occupancy sensor is all-important for something like this to be “smart” in any meaningful sense. so now nest has something it’s main competitor has included for years and it’s not even bundling them? not to mention this this is never going to be HomeKit compatible. I don’t understand how this works. How can these sensors control the individual temperature of rooms when there’s a centralised heating system controlled by the Nest thermostat. Does it keep heating/cooling under the highest/lowest temp of all sensors has been reached? Or is it smarter than that? Does the Nest work with Homekit yet? No. Read the last line. And I guess they never will. It’s not like HomeKit is the defacto platform for smart homes. Apple is giving that position away to Alexa. It doesn’t control the temperature in each room where there is a sensor, it just uses the temperature reading from that room to control the entire house. So the room you’re in will be the temperature you set, but the rest of the house will potentially be hotter or colder than that set point. It’s more convenient if your thermostat is upstairs say and during the evening you want to be comfortable downstairs you can have it read downstairs and then when you go to bed read upstairs so it’s comfortable in the sleeping rooms. Hope that makes sense. Just curious to who the main competitors to Nest are. I'm looking to replace the 2 thermostats at my house in the next month or 2. So why are we talking about a non-Apple compatible device owned by a competitor on an Apple specific website? Does it benefit this sites core mission to report this news? Save yourself the headache, buy an EcoBee 4, works with Apple, has Alexa, and supports cheaper remote thermometers that have been available for years.